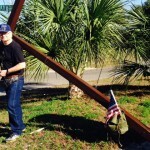 39 years carrying The Cross around the World! 39 years carrying the Cross! This picture was taken in Florida February 11 as I crossed the milestone marker of 39 years of sharing Jesus on the roadsides of the world.